Carbapenemase-producing Enterobacteriaceae is the newest superbug that is difficult to kill with antibiotics. 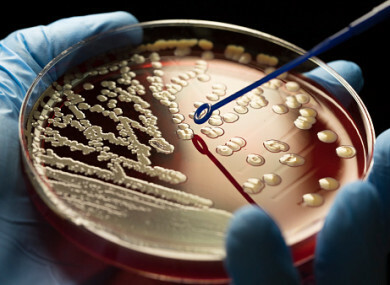 A TOTAL OF 26 people across Ireland have been hit with a superbug in the last four weeks. Called Carbapenemase-producing Enterobacteriaceae (CPE), the National Public Health Emergency Team has published its latest situational report on the bug. The figures show that between 12 March and 8 April, 26 cases were detected. Carbapenemase-producing Enterobacteriaceae is the newest superbug that is difficult to kill with antibiotics and pose particular problems in hospital environments. The World Health Organisation (WHO) and the European Centre for Disease Prevention and Control (ECDC) say that CPE is a serious threat to patient safety due to its resistance of medicines, meaning there are very few options to treat it. More than half of all patients who develop bloodstream infections with CPE die as a result of their infection. CPE has been identified throughout the world in recent years. Ireland has seen an increase in the number of cases year on year. The number of cases almost doubled in 2016 and is estimated to increase by a further third in 2017. The spread of this superbug in hospitals can lead to the closure of beds, wards and units removing thereby, essential capacity to provide services, to admit patients from Emergency Departments and to address waiting lists effectively. A National CPE Response Team was established in May last year to work with hospitals and other healthcare providers to combat the rise. The HSE says there is a variation in the implementation of the National CPE Screening Policy across hospital groups and individual hospitals, with a push to place CPE on a list of notifiable diseases. Email “26 people have been hit with a superbug in the last four weeks”. Feedback on “26 people have been hit with a superbug in the last four weeks”.